Other introductory articles on Domestic Well-Being Accounting (DWBA) have hinted about some of the new ideas upon which this new domestic accounting model is based. In this more technical introduction, the rationale, ideas and concepts are outlined in more detail, based on the coverage provided in a new book ‘Accounting for a Better Life’ (see www.dwba.co.uk ). This article is not a primer on accounting theory but some background is provided to help readers who may be unfamiliar with accounting and its terminology, to get a feel for what these new ideas are all about. At its simplest, an account is just a list of transactions relating to some area of financial activity or interest. The most familiar form of account is the bank statement that customers periodically receive from their bank. The account for their current or checking account shows the previous balance, all the increases and decreases that have happened over some period, together with a closing balance. In the old days of hand written accounts, that was all you saw; now with computerised support, you will usually also see a running balance showing the changing sub-total after each transaction, where the effect of all the previous transactions have been taken into account. Where you might have one or more savings accounts, you will appreciate that these funds are kept in separate accounts and customers will be used to seeing separate statements for each of their accounts or areas of interest. The first important thing to appreciate is that accounts are for accumulating information about value. We are so used to bank and credit card accounts which are all about currency that people sometimes do not realise that accounts are equally useful for accumulating transaction details relating to, for example, our home, our car(s) – one account for each car - our investments, etc. Although the amounts entered in each of these accounts will be currency amounts, the object being referred to will not always relate to a stack of cash but the value of that house or car for example, in terms of some currency. Accounts will usually have two columns, one for increasing (+) amounts and the other for decreasing (-) amounts. The next important concept is to appreciate that there are two distinct, overarching types of accounts that we can use in our sets or books of accounts. One is called an asset type account and the other is a liability type account. The asset type account as its name infers, typically relates to storing transactions for assets such as bank accounts, houses, cars, etc. The idea behind it is that positive amounts entered into the + column of an asset account signify increasing value; so £500 entered into the + column of an asset account implies an increase in value of £500, in relation to whatever purpose the account is being used for, usually evident from the name of the account. However accountants will also have in their business accounts, what I call working accounts for home accounting, as other accounts of the asset type which are not strictly for an asset like a car or a home. Examples include accounts for asset acquisitions and for depreciation. That other overall type of account is a liability account. It is used for accumulating debts and/or liability. Now we have the reverse concept in that increasing amounts e.g. £300 in the + column of these types of accounts imply more debt or more liability, whilst a decrease of £200 represents less of a debt. You might think more debt means less value but it all depends on the purpose for which a liability account is being used. Again, accountants mostly use liability type accounts for holding true debt amounts but again, have a need for other accounts of the liability type to mediate certain transactions. I refer to these as working accounts in home accounting and they do not relate to any true debts of a person or household; examples of these are for accumulating temporary information about asset acquisitions and growth in the value of a home. Here are examples of an asset and a liability account in MS Money. From the home accountant’s perspective I will mention here that from the technical words that business accountants use, which can make it somewhat confusing for the layman, there are words that everyone has heard of – such as debit and credit – which relate specifically to increases and decreases in relation to these two account types of asset and liability accounts. It helps to understand these but as has been pointed out in the general introduction, DWBA accounting provides considerable attention to simplification and minimising the need for accountant’s terminology; and there is more on this towards the end of this article. Another area for confusion here relates to the names for column headings used in the different software packages available to support accounting; in business, the convention is that debits (the + column for asset accounts and the - column for liability accounts) are traditionally in the left-hand column of each account, with the credits on the right (the - column of asset accounts and the + column of liability accounts. This convention is not always adhered to in some software packages, together with not always using the headings, debit and credit. The last bit of theory to mention which is important because it lies at the heart of DWBA accounting is so-called, double entry. This concept appears confusing to people because it has two slightly different aspects. First, it is an accounting concept which relates to an approach for taking into account (there’s an appropriate phrase!) all the financial aspects of some financial entity. In business where double entry is nearly always used, an entity might be a department or a division, a sole-trader or even a whole plc. For the domestic accounting environment, such an entity would most often be an individual or a household. The point is that the accounts supporting any of these entities consider or model the totality of the financial aspects of the entity. As such, the accounts will be able to capture and disclose or make visible, both the static and dynamic aspects of the entity finances; and we will look at these shortly. The practical effect is that a set of double entry accounts (the books) requires an account to store the total financial value of the entity as well as usually, some accounts for accumulating periodic changes in terms of increases and decreases to this overall value. The result is what is termed a balanced set of accounts, related to an ‘accounting equation’. The other common use of the word double entry is related to the bookkeeping techniques for implementing this form of accounting which, as we shall now see, requires two (double) entries in the accounts for each new transaction, in order to maintain the required balance. What do we mean by balance? Well balance is the key to double entry and it comes from balances in accounts, as maybe related in some way in this equation – the so called accounting equation. If you can accept that the balances of all the accounts representing the finances of an entity must somehow be related, we know from schooldays that related numbers is what equations are all about! If we had 20 numbers representing the 20 balances of these required accounts, we should be able to relate these 20 numbers meaningfully in an equation in some way. Let’s now approach this issue logically from the beginning to talk our way through to deriving the equations. Now if we had some debts, perhaps a mortgage on the house and a loan for the car, we could set up two more accounts (of the liability type) to hold these two debt amounts. The crucial point about the double entry system which requires us to take into account all aspects of our financial situation, implies that we need to setup an additional account in order to store the amount of our changing domestic worth. We call it a Domestic Wealth account. The next issue is what type of account do we need to hold the domestic wealth – asset or liability? When you think about it, the amount of the domestic wealth represented by the assets less the debts is owed to the eventual beneficiaries of the household or individual’s estate. The executors have to pay off the debts from the assets and what is left, the Domestic Wealth will be shared out amongst the beneficiaries - so the domestic wealth is a sort of liability from the viewpoint of the entity represented by the accounts. It is owed to the beneficiaries and therefore should logically, reside in a liability account. Now if we run a Trial Balance listing the balances of all the accounts in our ‘books’, we will see an asset of £20,000 correctly balanced by a liability of £20,000; also you will note that the single transaction of starting up with £20,000 involved one debit posting and one credit posting – which is an example of the implementation of the important double entry bookkeeping rule for accounting. Still balanced at £22,000 on each side! The asset a/cs are now made up of Bank (£22,000 - £7,000) and car a/c £7,000 with no change in overall value on the asset side but a distribution in values across the asset accounts. Another thought about double entry is that any single entry made to a balanced equation (set of balanced accounts) must unbalance it! The only way to retain balance is, from the maths perspective, add something to an account on one side and add the same amount to an account on the other side; or add something to an account on one side and reduce by the same amount, in an account somewhere else on the same side. This in effect, if you work it out, is what the accounting rule says in that a debit posting must be balanced with a credit posting. So far we haven’t considered changes to domestic wealth. As we buy food, drink and clothing, pay utility bills and purchase holidays, we will see reductions or credit in our asset account for bank or, if we pay by credit card, equivalent credit entries to increase our debts in the liability type account for each credit card. These are termed expenses and will lead to an equivalent decrease in our domestic wealth. We don’t tend to constantly decrease our domestic wealth account each time we have an expense but rather, accumulate all our decreases in a ‘bucket’ account setup for domestic decreases; and similarly for increases. It should be obvious that if we post credits as the first part of each expense transaction, we will need corresponding debit entries to balance them. Increasing debits imply an asset type account so that will be the sort of account that we need for these increases. By the same logic, income such as salary or pension will be first entered as increases or debit entries in our bank account and must be balanced by credit entries in a new account for domestic increases – increases that are credit entries occur in liability type accounts so this is the sort of new account we need to setup for accumulating changes for increases to domestic wealth. Traditionally, accounting for personal and home use has not made use of the principles of double entry; and the software packages that support home accounting are not usually geared up to properly support it. The reason is partly because when people ventured into home accounting, they tended to start with activities such as reconciliation of checking accounts and simple budgeting. For this, they tended to only require setting up accounts for one or two areas, mainly related to bank accounts. With this, as useful as it is, there is no concept of seeing the total picture, with the static and dynamic views of the financial state of affairs. In fact we are a bit ahead of ourselves here since we haven’t yet seen why we might want to use double entry accounting for domestic finances in the first place! When I first decided to start ‘doing’ my own home accounts many years ago, I believed that since business accounting had evolved over such a long time to be able to so successfully satisfy business managers’ needs to manage business finances (and there was a legal requirement for them to do so) there must be something special in business accounting that I could look for, to be able to help people better manage their personal and home finances. As described elsewhere, I discovered that business accounting methods themselves were of little help because of the wrong focus (profits for capital gain) and that the actual accounts, reports and associated business ratios were also, understandably, entirely inappropriate. In thinking about alternatives, I realised there were some features that could be extracted from business and with modification, be used effectively to help manage home finances. To explain which of the best parts might be useful, it is appropriate to first take a quick look at the business approach to accounting. This report gives us a good overview of the situation on a particular day. Of course, the individual items are understandably, not at all relevant to a household. The important issues are the makeup of the assets, liabilities and capital. The one figure that needs more explanation is that figure of £5,491 for Net Profit; and you probably know that in business, this dynamic, as opposed to static information, comes from the Trading account as modified by the contents of the Profit & Loss account. It indicates change over some period. Before we look at these last two business accounts for the changes, let’s compare the business balance sheet with my domestic balance sheet, to see the differences. Most of the entries in the business Balance Sheet come from balances in the accounts which can be easily extracted from a Trial Balance. The difference will be that for home accounting, we will have no need for the majority of these particular business accounts in which the business figures are accumulating. 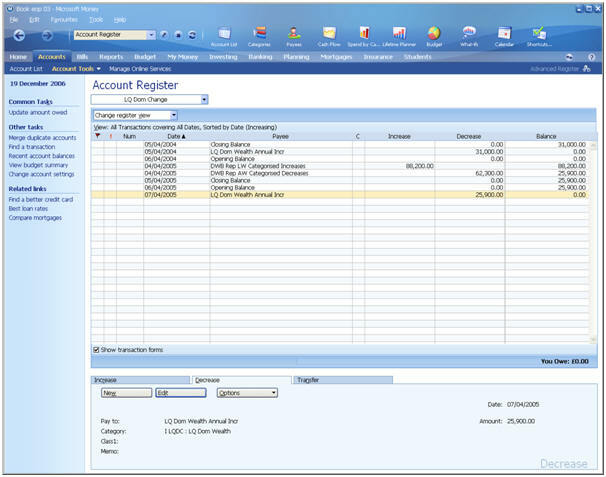 Here is an example of a Trial Balance which shows the balances of all the accounts in the books. I believe that many homesteaders would appreciate a version of the Balance sheet for home and domestic accounting as I did and so this is the first business feature that I adopted. In the version above, in contrast to the business report, you see the previous year’s figures together with those for the current year. The statement essentially summarises the static situation of some home finances on a certain day. It tells us everything there is to know. We understand from the accounting equation that the total assets less the liabilities at any time, gives us the domestic wealth so looking at the bottom of the statement first, we can see that the previous year’s domestic worth plus the new domestic change is the same as the new figures for total assets less total liabilities, the new domestic worth. In passing, I call a domestic surplus a domplus, when the Total Domestic Change (TDC) is positive, which you can contrast with a business profit. This can be compared with a domestic deficit, a domicit, which is the nearest equivalent to a business loss. The structure and contents of the Domestic Balance Sheet (DBS) are fairly self-explanatory and highlight the major components of the domestic assets and liabilities. It would be a question of personal choice how much information is included here but for a household, it is so easy and informative to include all the major components as shown here. A simpler or summary version would just leave out some of the lower levels of detail. Now, the big issue is what does the TDC, as a domplus of £25,900 consist of? We know that the business equivalent of profit or loss is exposed in those two accounts we talked about above. It would help to have a quick look at an example of these business accounts first, so let’s have a look at the business Trading account and the Profit & Loss account. This is the first of some dynamic views of business finances which present information about changes happening over some period. For business, the focus is on profits and so this account concentrates on the higher level aspects of the business with opening stock, the purchases made to augment this stock and the closing stock value. Against this, we have the sales figures, together with the effects of the costs of bringing in the stock; and changes due to stock and/or sales items having to be returned. The difference is the gross profit which is carried down to the P&L account. The next account called the Profit & Loss account shows the impact of other increases and decreases which usually reduce the gross profit to some lower value, called the net profit. At the bottom of this account, we can see that figure of £5,491 as net profit that we saw earlier, brought into the business Balance sheet. For business, these accounts adapted according to the nature of any particular business, serve their purpose as intended. They are not much use for a household though as fairly obviously, their focus is completely inappropriate. The individual accounts required by business have no place in home finances and I repeat, that we are not primarily interested in profit. What should the financial focus be for a home finances? Well I gave much thought to this and over some years, developed a new focus with an associated approach and methods, based on what I eventually termed, Domestic Well-Being. In short, yes, homesteaders do want to increase their worth or value, but not usually for ‘profits sake’. People want to increase their wealth to pay for things that tend to occur in a progression throughout a lifetime; like better homes, education perhaps, hobbies, luxuries and provision for those retirement and eventually, declining years when income is drastically reduced. Finally maybe, if anything is left over, people sometimes wish if they are not 'skiers' (spending the kid's inheritance), to provide help in the form of inheritance to the successors of the family for their future lives. In general, home finances in the earlier years of a lifetime are such that there is never enough to go round. Everything is a question of priorities and balance. What should be the best distribution of our expenditure to ensure that we can obtain the best possible balance or compromise, with the income at our disposal? My solution was to come up with a structure that best presented the major areas of domestic finances about which decisions could be made on how best to allocate funds – those alternatives and their prioritisation. So I needed a way that could be used to classify increases and decreases as and when they occurred, as well as for presenting the figures in an appropriate way after they had been accumulated. This presentation had to support the decision making that would be needed to best optimise future spending. It had to be done in a way that could achieve this best balance across the competing priorities so as to maximise Domestic Well-Being. It was therefore DWB that became the new focus for domestic accounting; and it could be identified in terms of a structure for both bookkeeping - capturing the transactions; and accounting - reporting, analysing and the subsequent decision making for future financial activity, implemented perhaps through budgeting. So let’s shortly look at a Domestic Well-Being Statement (DWBS). This is the domestic version of the Trading account and the Profit & Loss account and is used to present the derivation of the Total Domestic Change (TDC) over some period. It is essentially an edited report of the contents of the new, Domestic Changes account. For completeness, it is best shown in full detail but could just as easily be provided in a summarised form with some of the lower level detail rolled up into the higher level sub-totals. It represents the second of my adopted features from business accounting. Although it perhaps looks complicated at first sight, this report simply shows the structure for DWB and in un-edited form, is obtained in Microsoft Money with one click to run a pre-stored report. This edited version combines the details for the current and previous years to assist with comparisons. In summary, the report shows the three top-level Categories of the structure as the Basics, Discretionary and Others groups of transactions, each divided into Increases and Decreases. These categories might be considered as similar to business accounting nominal codes. Within these groups there are successively lower level groups of sub and sub-sub categories. For example, the Basics included Essentials, Responsibilities and Family, each with further sub-categories below. The Discretionary group, where obviously there is some amount of discretion or choice as to whether decreases and increases occur in its component sub-categories, includes Nice-to-Have, Investment for the Future (IFF) and Luxuries. We will look at ways in which information from this statement can be used in the analysis process, to help decision making in support of any changes that might be contemplated for the follow-on period. What amazed me when it was first developed was the fantastic visibility it provided on the home finances, especially showing the distribution and makeup of the many expense items. Please take some time to study the DWBS in order to be able to appreciate what a range of information it contains. Also, remember that it is only a summary and that all the underlying information in terms of which transactions were included in each sub-category is just a mouse-click away; as is the detail about the accounts from which the transactions originated. Another statement common in business accounting is the Cash Flow Statement. A domestic version of this report can also be easily created but is not shown here as it could be considered as perhaps a report of a more optional nature, in home accounting. The third feature that I adopted from business accounting is the use made of financial ratios. You will appreciate that a ratio is simply a comparison of two figures expressed as a quotient, usually in decimal or percentage format. In business over time, certain key quantities and their comparison in the form of ratios have taken prominence as a key to both information dissemination (for shareholders, investors, management boards, auditors etc.) and to various levels of management as a basis for control. Those two components of a ratio, the numerator and denominator, can both be considered as candidates for achieving change. Changing something to affect the value in one of these ratios may have untoward affects as through feedback, other ratios may be affected that focus on some other aspect of the overall business figures. Business of course spends much time on ‘what-if’ spreadsheets, simulation and modelling as part of ratio analysis, to try to determine the optimal way to effect the changes to achieve the business aims, whatever they might be. Business figures, like the domestic figures above have countless possibilities for utilising and comparing two numbers from the reports to establish useful ratios. There is also the need to compare like with like – two changes or flows over a period or the proportion of two static values such as fixed assets against total assets, on a particular day. Over 30 business ratios slim down to few that most people have heard of, such as the different forms of margins and the ratios associated with profitability and liquidity; and of course virtually none of them relate to domestic finances! From my experience a long time ago with modelling, simulation and control of road traffic, I knew that the figures I had exposed for domestic finances must have some potential for assisting in the management and control of home finances. The issue was which figures and in particular, which groupings of pairs of figures as ratios might be informative. It is not appropriate to prolong this discussion of ratios in this introduction; but to summarise, I have defined five primary factors and a number of secondary factors for domestic finances, changes in which I believe have a correlation with those stages of financial life and could be useful as a basis for comparison and more detailed analysis. Basic Cost of Living Factor (BDD/THI) – a measure of the amount spent on basic necessities, out of total household increase. Well-Being Contribution Factor (DDD/THI) – a measure of the amount spent on discretionary extras, out of total household increase. Future Affordability Factor (IFF/TDI) – a measure of financial commitment to future well-being, out of total domestic increase. Feel Good Factor (IFF/DDD) – a measure of how much went on future well-being, out of total discretionary decrease. Domestic Wealth Factor (TDC/ODW) – for positive TDC the domplus, or for negative TDC the domicit, contributing to growing or diminishing domestic wealth respectively, as a proportion of old domestic wealth. This is the nearest comparison to business profit or loss. To start with, lacking any reservoir of accumulated figures, the value of these ratios or factors as I call them for home use, will only be of use internally in a household over time, as a means of measuring and looking for changes. With a base of figures, then there would be the possibility of comparison with others and the similarity to business norms that are used to compare like with like as a measure of conformance or acceptability with other similar entities. Value for these five factors give ‘shape’ to a financial situation and if displayed in the format of a star or radar diagram, I believe could also offer useful indicators that could help to predict problem areas or states of stability or instability about a set of finances; more research would be required in this area, as well as for using simulation to accumulate a base of domestic factors as domestic norms, as basis for comparison. With an accumulation of values for the domestic factors, either by simulation or by capture after creation by individual home owners, it would become feasible to create and provide charts such as the ‘artificial’ one shown below. This would enable a home owner to go in with salary on one axis and to be able to determine for family size, the expected value of a factor such as the Basic Cost of Living Factor (BCLF). It would be likely that different values for each factor would be appropriate corresponding to the different stages of domestic, financial life. With such information, the home owner would be able to determine if the individual figures from the accounts appeared to lie within the expected domestic norms. A picture speaks a thousand words. This is no truer than when considering displays of financial information. 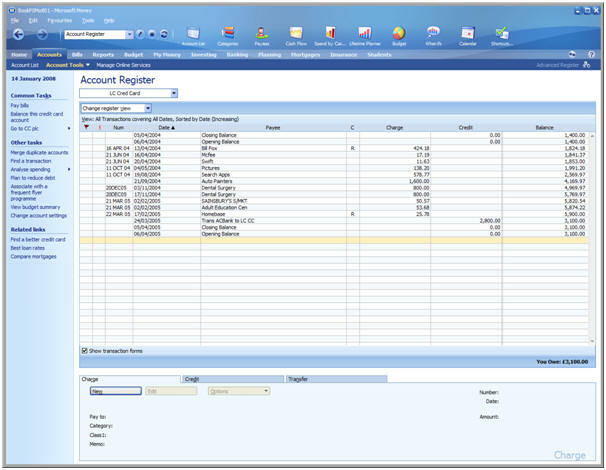 Here are a few examples as the fourth set of business features of the sort of products that can easily be created with general purpose accounting software packages such as MS Money, especially if double entry accounting is used. Some of these required a data transfer (1 click) from MS Money to a spreadsheet package for further exploitation. The subject of control is stimulating and quite complex; it relates to targets, what is controllable and what should be controlled; and to measurement and comparison. For home finances, I am sure that control is both feasible and realisable and is only limited by the extent to which homesteaders wish to go. It all comes back to that issue I have raised elsewhere, relating to a need for a sense of responsibility. The analysis, once figures have been produced at the end of some period, should first look at distribution and balance. 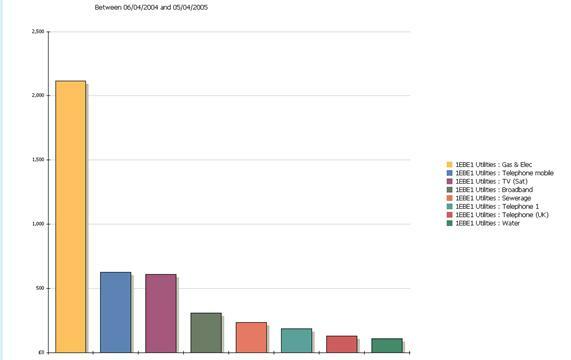 Are the proportions for example, being spent on the Basics, a fair amount compared to the total increase? The information obtained from your end-year results should reveal or tell you, some fundamental facts. Have you been able to afford anything, over and above the basics? If the answer to that is positive, did the amounts enable a reasonable allocation to discretionary decreases, and what about luxuries? At the next category level down, what does the distribution look like, within the basics, and within the discretionary categories? For the basics, do you have a reasonable distribution between essentials, responsibilities and local-to-family concerns? Your accounts and this new set of accounting methods will give you the data and information to enable you to pick up warnings. What sort of warnings might you want? In today's climate of a financial debt crisis, probably the most important warning you would look for, is one relating to the likelihood of such a pending crisis for you. You would want to know if your decreases are getting too close to your increases, or even exceeding them. You would want to know if your reserves are being depleted, possibly on funding that excess of decreases over increases. You should be looking to see the amount of short-term and long-term liabilities you have, to see how they compare to the previous year's figures; and how their proportions compare to the total value of assets (one of the new, secondary financial factors). You would want to know about your liquidity; how well you are able to realise funds in the short term to meet your known commitments. You obviously do not want to sell your house or car just to pay the bills. On a less dramatic but more important note, you need to know about the proportion of contributions being made to future well-being; and if positive, does the amount being put aside represent a reasonable proportion of your increases? Your 'responsibilities' subcategory, under the basic decreases category is important and so you should guard against any indications of potential difficulties in this area. In relation to well-being, we looked at some of the perhaps, less significant aspects of contributions to improving domestic well-being, so warnings in this area would be pertinent. Rather than alarm-bells, a conscious decision once in a while to look at decreases occurring in the sub-categories of 'Nice-to-Have' would do no harm. Check to see if you are making reasonable, affordable and balanced expenditure in these areas, such as on holidays, entertainment, leisure and hobbies. Detection involves a quick, manual scan down the results of the formal reports - the DWBS, and DBS - for anything unusual, particularly compared to the previous years. Anything detected that is unusual requires further analysis, with perhaps, comparisons with figures further back in time or detailed checking in the accounts themselves. With experience, you will realise that account details can be examined from so many different places such as the categories, payees and budget screens, as well as from the results of the various reports obtained directly from the accounts. In order to implement the features I have extracted from business accounting, I needed to be able to use the concepts of double entry that I described earlier. The implication was simply that I would need the few extra accounts to make the concept of balanced accounts possible for all the financial aspects of a household, together with some double entry bookkeeping techniques to subsequently keep the domestic accounts properly balanced. In my own experience, I did find business accounting ideas very difficult in the early days. Although I completed a business studies correspondence course some 40 years ago in conjunction with a career change (but didn’t actually need it in the end!) I found I knew enough to get me started when I began to investigate implementing my own home accounts when computers like the Commodore 64 emerged on the scene. In undertaking home accounting in conjunction with double entry, the main difficulties I realised, related to knowing where I was in relation to individual accounts and the entering of transactions. By this, I mean that when looking at a single account register on the computer screen, it never appeared obvious to me what sort of account I was looking at and into which column of the account, the next posting should be made. Over time, I realised that the key to understanding the answers to this dilemma lay with the accounting equation. The mathematics of keeping accounts balanced was quite easy and from school maths, it was just a matter of applying those rules I discussed and demonstrated earlier. This was all about posting the value of a transaction equally to two accounts on the opposite sides of the accounting equation (with two increases or two decreases) or applying opposite postings to two accounts on the same side of the equation (with one increase and one decrease). To make this implementable, I needed a way to always be able to associate any account with its place in the accounting equation – asset or liability. Since we have those two basic types of account which dictated which side of the equation they belonged to and in my system, I had defined a number of subcategories for each of these asset and liability accounts, so all I needed was a two-character prefix in front of each account name. With this, I always knew by looking at an account name, exactly what its purpose was and where it resided in the domestic accounting equation. The first character of the prefix was always A or L – for Asset or Liability. For asset accounts, I have sub-categories for Fixed Assets (AF), Investment Assets (AI), Working Assets (AW) - which are those accounts for mediating certain of the transaction postings; and a final pair of sub-category which I call Quasi Assets (AQ); and Quasi Liabilities (LQ) in the liabilities group. Sub-categorising certain accounts as ‘quasi’ accounts was my way to distinguish between true assets or true debts and the assets and debts associated with domestic wealth or business capital. Like many amateur accountants I always had problems with reconciling the concept of debts in accounts for mortgages and loans, with a so-called liability related to an amount in a capital or domestic wealth account. To me, domestic wealth was a ‘good’ liability – more was better – whilst the mortgage and loans were ‘bad’ liabilities or debts that had to be repaid; and more was not better, but worse! I resolved this by considering all the accounts that were associated with domestic liability as quasi-liabilities – good liabilities; the amounts or the balances of liability held in these accounts, I considered as ‘good’ liabilities, not debts that I should be worried about but that could be left to my executors to sort out in the future. There are a total of four accounts that fell into this quasi group which consisted of the Domestic Wealth account (LQDW), the Domestic Changes account (LQDC), the Categorised Increases account (LQ Cat Inc) and the Categorised Decreases account (AQ Cat Dec). The Domestic Changes account is the home accounts equivalent of the business Profit & Loss account. As such, positive contributions from gains on disposals, appreciation of the value of the family home and of investments, all end up here. The balance of this account will similarly be reduced by for example, decreases on disposals and any depreciation on the car or our investments. So at the end-of-period, the final balance in the Domestic Changes account, as Total Domestic Change (TDC), will be passed to the LQDW account. It is the TDC that is the final balance of the DWBS and which also appears as the last entry on the DBS. The majority of the changes to domestic wealth over any period come from the decreases associated with expenses such as food, drink, clothes, utilities, holidays etc – virtually all of the Basics and Discretionary decreases. These also end up in the LQDW account via the LQDC account but because of the way I handle most of the double entry postings, they arrive via those two quasi accounts for Categorised Increases and Decreases that I discuss below, under Implementation. In the Domestic Changes (LQDC) account below from MS Money, you can see the categorised increases and decreases being brought into the account. Finally at the end-of-period, that amount of £25,900 as the TDC is passed to the Domestic Wealth (LQDW) account so that the DC account is zero, ready to accumulate changes during the next period. Once the PC compatibles arrived, I migrated from the Commodore and chose one of the earliest versions of a generalised accounting software packages called MS Money. Being generalised, it provided the capability to create accounts as needed, with any name you chose. It also had very good integrated query and reporting capabilities, together with the concepts of payees, categorisation tags and support for budgets as well as for stocks and shares. The product later became very bloated with all sorts of associations to web sites for purchasing financial products. However the basic accounting components remained fairly static with an important later introduction of support for the on-line uploading of transactions from financial institutions, such as banks and credit card companies. I always use a semi-automated approach to bookkeeping so that I can remain totally in control of what goes into my accounts and also be aware of all the changes. With fully automated updating, you could easily fail to notice some important transactions – although they would always be present in the accounts and accessible at any time through direct observation and via reporting. In thinking about the implementation of double entry, MS Money was not designed primarily for double entry. If it was, it would have some journal-like arrangement similar to dedicated double entry accounting software, whereby each transaction is associated in some way with the two accounts involved in the double entry. Then, via a key-click or later batch updating, the two individual postings would be made to the appropriate two accounts. This does not mean to say however that this package cannot be used for double entry postings. All it requires is that after adding the necessary extra accounts, that two entries are posted for each transaction entered. I have mentioned that categorisation tags are provided with MS Money and there are two sorts – Classes and Income/Expense tags. The idea here is that with the power of software, tags can easily be provided and their use made available behind the scenes for linking tags to the individual transactions. For example with classes, if there were two properties or two individuals associated with a set of accounts, each transaction could be referenced as appropriate, to a class entry so that later, via reporting, all the financial aspects of one property or person in association with perhaps dates or particular accounts, could be easily extracted. The other form of categorisation available in MS Money is its Income and Expense tags. Money comes pre-loaded with tags associated with home finances so that for example, with a simple account (non-double entry system) account for reconciliation with bank statements, each transaction could be associated with an appropriate tag, such as wages, food, etc. As well as a pure tag with a link to some category, their association can be to income or expense. These are the terms used in MS Money to relate to the accounting terms of debit and credit; and unfortunately they are not associated with the traditional left and right orientation in each account register of debit on the left and credit on the right. 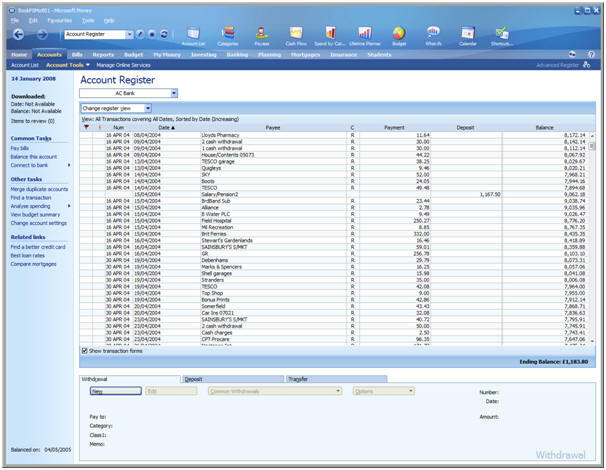 Perhaps trying to be helpful to home accountants, MS Money has differing column headings for the increases and decreases across all the various types of accounts that can be created. I found this very confusing; and I would prefer just debit and credit or just income and expense. I resolve this problem with some simple ‘memory joggers’ that makes it nearly impossible to go wrong! In the days of manual computing, there was no automation to support the implementation of tagging so the effect had to be achieved by manual methods. This meant for example, creating individual accounts for each class of information and accomplishing the necessary bookkeeping such that it would have been a very laborious and time-consuming process. In trying to find a way to implement the tagging I needed to associate transactions with the DWB structure as well as achieve double entry to support the concepts of static and dynamic reporting, I came up with a method that achieved both, without the need to enter transactions with hundreds of double postings. This combined tagging to do two jobs – provides the journalising cross-referencing needed to associate each posting with its ‘partner’, as well as to ‘mark’ each 1st half of a double entry at its time of original-entry. The 1st halves of the appropriately, categorised double entries accumulate in the accounts where they were entered, mostly bank or credit accounts but that is unimportant. At the end-of-period by running a single report, the sum of the amounts of the 1st half entries can be easily exposed, contributing separately to increases and decreases to domestic change. By then entering just two more postings, one for the total of the 1st half increases and another for the total of the 1st half decreases, balance is re-established. These two final postings could be made directly into the Domestic Changes account but it is more useful to distinguish the categorised contributions to TDC, from uncategorised ones. This therefore is the explanation for those two quasi accounts, the AQ Categorised Decreases account and the corresponding, LQ Categorised Increases account. Their balances of course are eventually transferred through the LQDC account to the LQDW account, as part of the end-of-period processes. 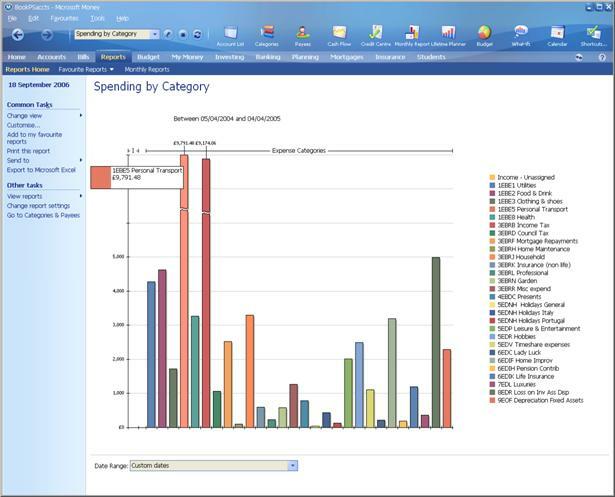 The main features that I have adopted from business accounting are the ability to create balance sheets, to capture the financial changes over a period, to define ratios/factors as a comparison of useful and significant figures from the balance sheet and changes, as well as the use of graphical reports to enhance visibility and meaning. In contrast, what I have left behind from business accounting is most of the individual accounts by name which, of course quite understandably, have no bearing on the character of home finances. I have also given much attention to simplification in order to make accounting as easy as possible to undertake at home. In the Trial Balance which lists all the account balances at some particular time, for the current and previous years, you can see how the prefixes help to show the purpose of each type of account and by implication, where it lies in the equation. In this version, I was calling the Categorised Decreases account a so-called working account (AW) but now, I more correctly classify this account as the one and only AQ account. As a thought about setting up DWB accounting for yourself, my book describes the background and theory, together with the details and prototypes for accounts, categories, reports and graphics on a bonus CD for implementing the system on MS Money. I believe that the methods should also be capable of being implemented on any general-purpose accounting software with good reporting capabilities and support for categorisation. See also Implementation Issues. Regarding implementation on dedicated double entry accounting software packages, I have not yet discovered any that are sufficiently general-purpose to enable the creation of accounts of your own choosing, together with your own details of categorisation. I suppose again understandably, these packages have been developed specifically to support business accounting. The accounts and their structure therefore, together with the associated processes are so intimately tied to business accounting concepts to make their adaptation to support home and domestic accounting impossible. In addition to simplifying, you will already realise that I have added some words and techniques that also, I believe, add to understanding. Capital, revenue, receipt, payment, profit, gross, net, real, nominal, journal, ledger, margin, sales, purchases, commission, debtor and creditor. Asset, liability, debit, credit, income, expense, gain, loss, payee, fixed, current, long-term, investment, transaction, entry and post/posting. Temporary or Working accounts, increase, decrease, Domestic Change account (DC), Total Domestic Change (TDC), domplus, domicit, Domestic Wealth (DW), quasi-asset (AQ), quasi-liability (LQ), categorisation, cross-referencing, tags, tagging, indexing and account name prefixes (AF, AI, AC, AW, LL, LC, LW, LQDC and LQDW). This group also includes all the new components of the domestic well-being (DWB) structure and all of the new Domestic Financial Factors (DFF) as well as the reports DWBS, DBS and DCFS. An understanding of one idea - double entry - and the following, six key words, will get you through with flying colours: asset, liability, debit, income, credit and expense; and my version of the domestic accounting equation and a couple of 'memory joggers', will tie all these features together - so, no problems! Have fun, and enjoy the benefits that can so easily, be yours. 'Accounting for a Better Life', an authoritative book, written with rigour and thoroughness, is published by Troubador Publishing Ltd. under the Matador imprint (www.troubador.co.uk) and became available from August, 2007.